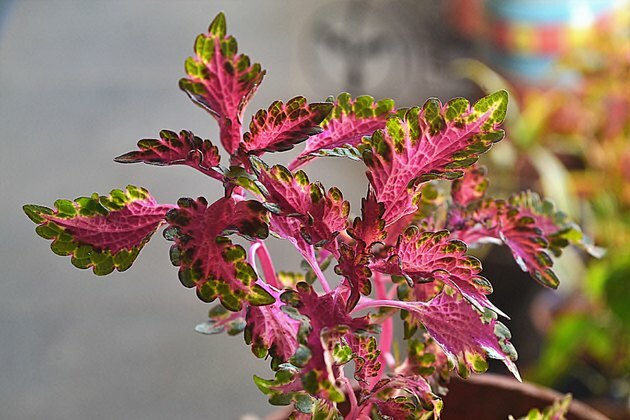 If you've ever seen a coleus plant (Solenostemon scutellarioides), you've likely marveled at its highly colorful and intricately patterned leaves. Grown as an annual throughout the United States and as a perennial in U.S. Department of Agriculture plant hardiness zones 10 through 11, coleus also makes a good houseplant that decorates an indoor environment with non-stop color. 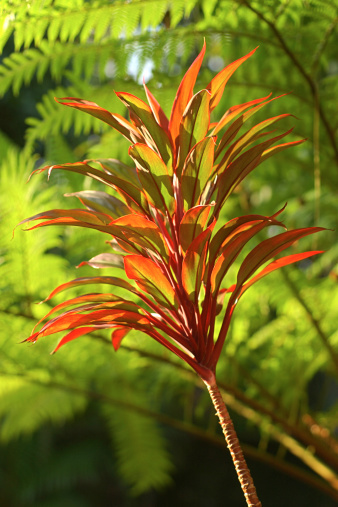 An easy-to-grow plant, it thrives with just basic care and a bit of extra attention to keep the plant bushy and well-shaped. A coleus houseplant does well in any type of container, including one that's plastic or ceramic, provided it has at least one good drainage hole. You can keep a saucer under the pot to protect furniture or carpets. But remove it when watering, and let the pot drain completely before putting it back on the saucer. The coleus thrives in any type of commercial potting soil. Or you can make your own soil-based mixture by combining equal parts of compost, topsoil and sand. Sterilize the topsoil first by heating it on a tray at 200 degrees Fahrenheit for 20 minutes. For a soil-less mix, which tends to be less dense than soil-based ones and drains especially well, combine two parts peat moss, one part perlite and one part coarse sand. When growing a coleus indoors, keep the soil evenly moist, watering the plant whenever the top inch of soil feels dry to the touch. If the plant's soil becomes completely dry for any period of time, leaves may wilt. If it stays dry, the coleus leaf may fall from the plant. It's also a good idea to place the coleus pot on a water-filled tray that contains pebbles to raise humidity in its vicinity. Make sure that the water level stays just below the top of the pebbles to avoid water-logged soil. To keep the plant growing well, feed it every two weeks during spring and summer with a water-soluble, 10-10-10 formula diluted to half strength. That works out to about 1/4 teaspoon per 2 gallons of water, but check your product label for additional directions. A coleus that's grown indoors does best in bright, indirect light, such as in front of a lightly curtained, south- or west-facing window. It can also tolerate a bit of direct sun, but protect it from strong summer sun, which can scorch and burn the delicate leaves. This plant is tolerant of normal indoor temperatures, generally 65 to 75 degrees Fahrenheit. But it could suffer if it's in a draft during the cold winter months. Keep it well away from drafty windows and doors, and don't place it close to air conditioning vents in the summertime. A coleus that's grown indoors might become leggy with time, especially if it's grown in low-light conditions. Pinching back growing tips regularly helps prevent this problem and promotes attractive, bushy growth by stimulating lots of branching. The coleus produces tall spikes of tiny, inconspicuous flowers during spring and summer. Pinch these off as they appear to help direct the plant's energy into more leaf production and to prevent setting of seed, which also drains plant energy. A coleus houseplant is usually trouble-free, but watch for damage caused by spider mites, which are especially prevalent in dry indoor air. If you see web-like coverings on young leaves causing them to wilt and dry, spray the plant until it's dripping with insecticidal soap, diluted at a rate of 6 tablespoons per gallon of water. Repeat the treatment every two weeks as needed.